All six Expedition 48 crew members gather in the Zvezda service module sharing a light moment and a meal. 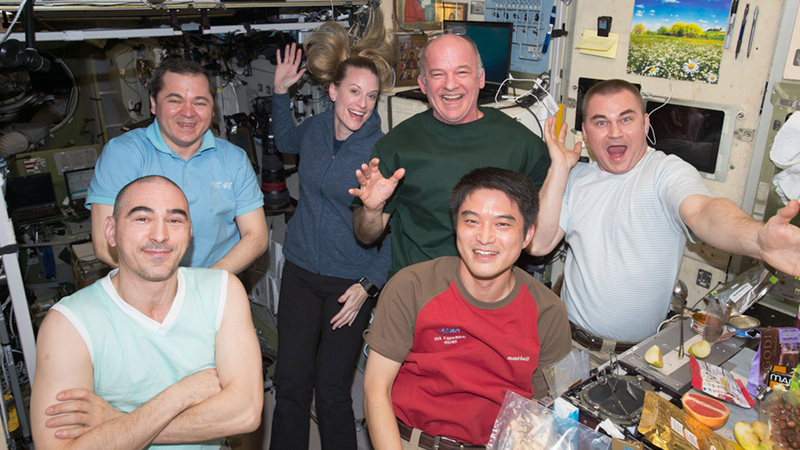 From left are Anatoly Ivanishin, Oleg Skripochka, Kate Rubins, Commander Jeff Williams, Takuya Onishi and Alexey Ovchinin. Three astronauts are relaxing today in recognition of Mountain Day, an annual Japanese holiday in effect as of 2016. The three cosmonauts stayed busy with their set of Russian science and maintenance tasks aboard the International Space Station. Commander Jeff Williams and Flight Engineers Kate Rubins and Takuya Onishi took the day off Thursday. Williams and Rubin, both NASA astronauts, will be getting ready for an Aug. 19 spacewalk to install the first of two International Docking Adapters. The two adapters will allow new Commercial Crew vehicles being designed by Boeing and SpaceX to dock at the station. Onishi will assist the spacewalkers and monitor their activities. Veteran cosmonaut Oleg Skripochka, on his second station mission, sampled the air and surfaces in the station’s Russian segment checking for microbes and quality today. His fellow cosmonauts, Alexey Ovchinin and Anatoly Ivanishin, worked on communication connections between systems in the Russian modules. One weird question: in the picture of the cosmonauts relaxing and hanging out during Mountain Day, they were in space, right? Kate Rubin’s hair was floating as things float in space, as we’re shown/told. How come the food is not floating? I thought people had to eat space food in space, not real food. Or can you eat real food? Or are they on earth? And are the two guys in the front floating, or sitting? I just want to know. I’m very interested in this kind of stuff–I might want to do these kind of things as a career one day. I find NASA very fascinating, as well as everything you do.